what is steel rule die cutting? For a complicated design, you might need more than one size die cutting process. It depends on the quantity and type of materials your project requires. You might need one of several die cutting processes. Learning about details about steel rule die cutting will help you understand the fundamentals better, which can help you save time and money. We are discussing steel rule die cutting in this article. Steel rule die cutting is a very normal and cheap way to cut a shape out of a sheet material like foam, paper, cardboard, rubber, plastic, cork and so on. It a material can be cut with scissors, it means it can be die cut by a die cutting machine. Normally a die cutting die is made up of by 3 parts: a die board, steel rule cutting blade and rubber ejection. 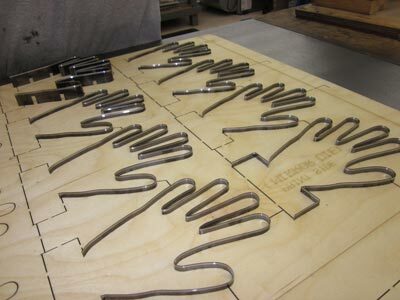 Die board is commonly cut into the shape by die jigsaw machine or by laser die cutting machine. People call the cut a kerf and in order to make it holds the steel rule blade, the kerf is usually slightly smaller than the width of the steel rule die cutting blade. The sharp steel cutting rule is bent by steel rule die bending machine into the designed shape and pounded into the die board kerf with a soft faced die mallet. Rubber ejection is for pushing the die cut part out of the cutting die. There are many different forms and firmness. You need to choose the right one to ensure the long-term accuracy and the long life of the die. Steel rule die cutting is a hard process to cut a material with a sharp steel rule die cutting blade. The leading edge cuts the surface but as it is forced further into the material, the blade pushes the material apart along the cutting edge until it fractures and separates. Harder materials like film and paper actually fracture and are completely cut before the blade fully penetrates. Soft materials on the other hand do not fracture. The cutting action occurs when the compressive load of the material exceeds the force needed to begin cutting edge penetration. A dull die will require more force and compression that can lead to finished part distortion with soft materials and fuzzy or rough bur edges on rigid materials. Laser die cutting machine is a very common way to handle die board cutting. But now Yisong High Technology is giving die makers a new choice for die making. Automatic die sawing machine is automatic, environmentally friendly, high cutting precision and also very cost saving. The die plates handled by this machine can be more durable which makes steel rule die cutting higher accuracy and a greener way to go.